Analysing at which time daily market extremes are established shows the significance of the first and last hours of market action. See how different markets show different behaviour and see what can be learned from this analysis. A day of trading usually starts with a lot of fantasies for the future, then we try to survive the day and end it with a lot of hope for tomorrow. This psychological pattern can also be shown when analysing intraday market data. 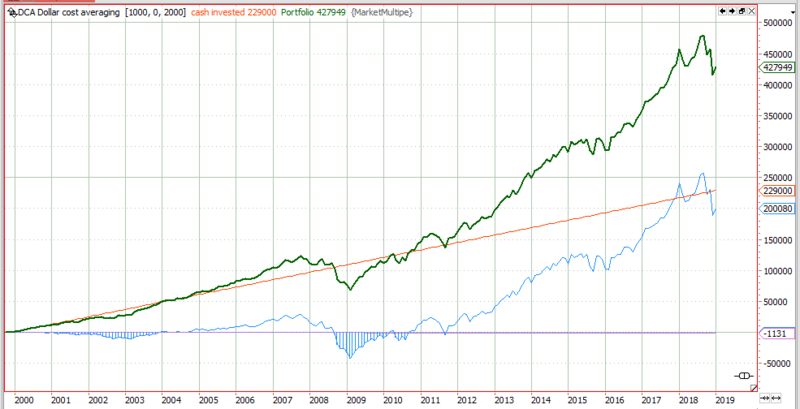 A high level of fantasies usually leads to a strong market movement, and thus market extremes can often be seen near the beginning or the end of the trading session. The chart above shows the probability of making the daily high or low at a specific hour of trading. All analysis is done in German timezone. The top left chart shows the time-extreme distribution for the SPY. It can clearly been seen, that the probability of marking the daily high or low is highest in the first and last hours of trading. The same is true for NBP, the chart on the upper right. Like SPY NBP shows a great likelihood to mark the daily high or low in the first or last hour of trading. Thus, if a new extreme value is shown later in the trading session, this will likely end in an extreme opposite the one build in the morning. A new high in the afternoon, after a weak start, leads to a higher high. This can be used for trading. German DAX Index, the chart in the lower left corner, shows a different behaviour. It basically catches up with the late night American and overnight Asian movement in the morning, and then keeps within it’s firs hours range. No big hope at the end of the index session, as the american markets usually just open where the Europeans close. The DAX futures will show a different behaviour, as their trading time also incorporates the american trading. EURUSD, the chart in the lower right corner, shows a different pattern. As it trades 24 hours a day, the significance of the different session can be seen on the chart. Over night only a few new highs or lows are marked. They are marked between 8 and 9 in the morning, when the European traders come into office, and in the afternoon between 3 and 5, when economic data is released. A simple opening range breakout strategy makes uses of the pattern shown above. It waits for the first third of the session, and takes a position if a new high or low is build afterwards.The trade is closed at the end of the day. As NBP has a high probability of closing either at the high or low of the day an exit at the end of the session makes sense. Also waiting until the first third of the session is over is useful, as there is a high probability that either the high or the low has been established. If one of these points is crossed in the second part of the session, the probability is high that the market will keep it’s direction. Both observations are made on the time distribution diagram and translated into a trading strategy. The stock market shows some astonishingly stable date based patterns. Using a performance heat map of the S&P500 index, these patterns are easily found. Algorithmic trading adds noise to the markets we have known. So why not add some noise to your historic market data? This way you can check if your algorithmic trading strategies are fit for the future. Learn how to generate noisy data and how to test your strategies for stability in a noisy market. Monte Carlo Simulation uses the historic returns of your trading strategy to generate scenarios for future strategy returns. It provides a visual approach to volatility and can overcome limitations of other statistical methods. Bullish? Buy stock or sell put option? So you are bullish on a specific stock, but you also have realised that timing is major problem? So what would be the best strategy to implement your bullish opinion but avoid the problems of any timing strategy? The Hindenburg Omen – Stock Market Crash Ahead? I have been in search for a signal I could use for a short vertical spread or naked short option strategy. So my main concern has been to find a level, which will most probably not be penetrated over the next few bars. The CBOE volatility index VIX measures the market’s expectation of future volatility. This article will show you some key statistics of VIX and help you to decide if it is better to buy or to sell volatility. The spikes to the top and the long phases of relatively low volatility are reflected in a left-leaning distribution diagram and a long tail towards the higher levels. The median value is 17%, meaning 50% of the prices are above (below) this level. The next chart shows the distribution of returns over 25 trading days. The median price movement being slightly shifted to the negative area shows the mean reverting characteristics of volatility. The median 25 bar return with VIX above 25 (green) is around -15%, only 20% of the returns are positive when VIX is currently above 25. Sell volatility. 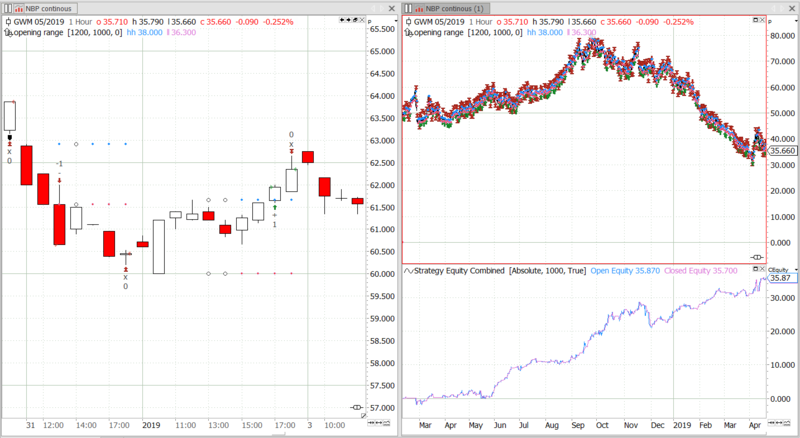 The above chart suggests that going short on volatility, if VIX is above 25, seems to be a good idea. But it is not without risk. The chart below shows what can go wrong during the next 25 days. The distribution diagram gives the maximum adverse movement of the VIX, with VIX currently trading above 25. The green line, VIX currently above 25, shows a +10% median maximum up movement over the next 25 days. So do not expect a short vola position to be without risk. Some adverse movement has to be expected. On the other side, the distribution of the maximum loss of the VIX during a 25 day period shows a median of below -20%. This represents the profit potential of a short volatility position. 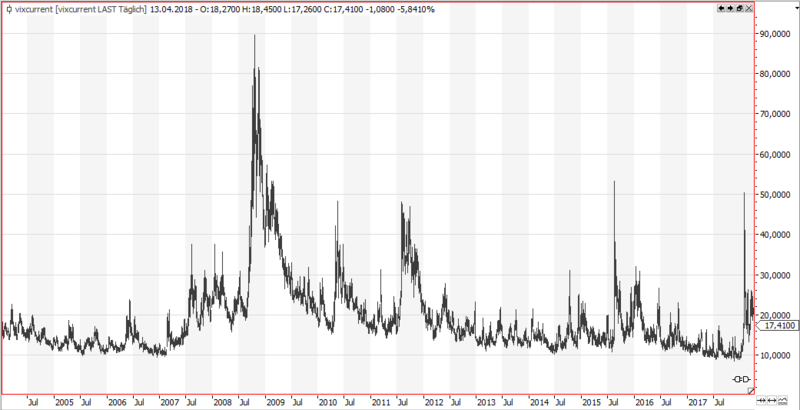 If you plan to short volatility wait until VIX is trading above 25. If you want to buy volatility, do so if VIX is trading below 15. I always thought that inspiration and experience are key factors in trading. But every time my chess computer beats me without any inspiration, just by brute force, I get my doubts. This article will be about a brute force approach in trading. The kNN algorithm. This article will be a short introduction to machine learning. I will use a classic algorithm of machine learning to let my computer find a prediction for tomorrows market move. In the meantime I’ll have a glass of wine with some friends and let the machine do the job; At least that’s the idea, but can it be that simple in real life trading? The kNN algorithm is one of the most simple machine learning algorithms. Learning, in this case, is only a nice sounding label, in reality kNN is more of a classification algorithm. The scatter chart above is a visualisation of a two dimensional kNN data set. 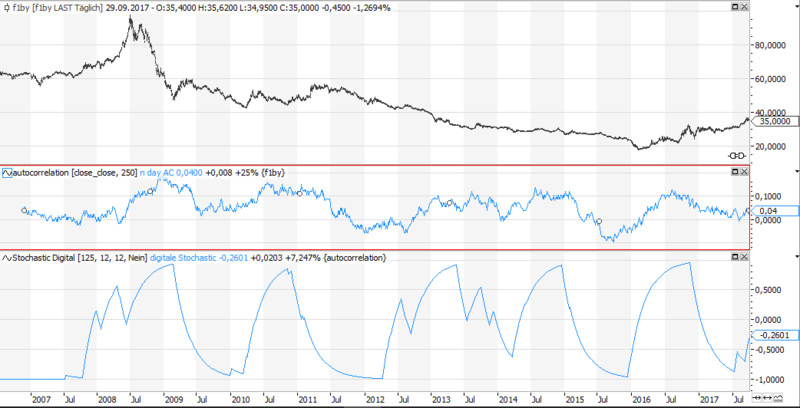 For this article I used a classical indicators of technical analysis to do the prediction: a long-term and a short-term RSI indicator. The dots on the two dimensional scatter chart represent the historic RSI values at a given point of time. Now have a look at the fat circled point. This point represents today’s value. It means, that today’s RSI1 has a value of 63, and RSI2 got a value of 70. Additionally to the position on the chart the dots have got colours. A green dot means that the market moved up on the following day, a red dot shows a falling market on the day after. We already know what has happened in history, so it is easy to colour the historic dots. But we do not know the colour of today’s dot, as it is not known where tomorrow’s market will end. Based on the chart above, will it be a red or green dot? Will tomorrow be up or down? Should I go long or should I go short? Call it classification or prediction, the two dimensional kNN algorithm just has a look on what has happened in the past when the two indicators had a similar level. It then looks at the k nearest neighbours, sees their state and thus classifies today point. In this article I would like to show you an implementation with the Tradesignal programming language Equilla. To implement the algorithm in Tradesignal we first have to do the shown scatter plot. The algorithm stores the values in an array. 16/17/18 stores everything in an array. The next task to complete is to calculate the distances of today’s RSI point to all the historic points in the training data set. 23/27 calculates the euclidean distance of today’s point to all historic points, line 29 then creates a sorted list of all these distances to find the k nearest historic data points in the training data set. Have a look at the scatter chart at the beginning. If this would be the data stored in our training data set, the prediction, using the 5 nearest neighbours, would be -5. All the 5 nearest neighbours of our current data point are red. Now that we got a prediction for tomorrow, we need to make use of this prediction and trade it. The returns then will show if everything works as predicted. Over here I just do a simple long/short interpretation of the prediction, but of course you could also use the quality of the prediction (+5 or +1?) in some sort of way. 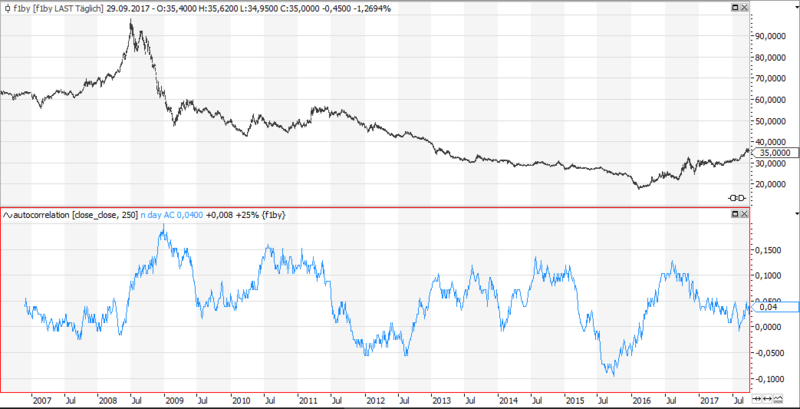 Position sizing…? The next chart shows 2000 bars of daily Brent data. It uses a 14 and 28 day RSI to predict the next day’s move in the Brent oil market. The training was on the first half of the data set, and the 5 nearest neighbours did the classification. Underneath the chart the returns of this test are shown. (strategy equity). On the bottom of the char you see the two RSI indicators used for the generation of the prediction / buy-sell command. The kNN algorithm offers a framework to test all kind of indicators easily to see if they have got any predictive value. Judging on the shown graph it seems to work. 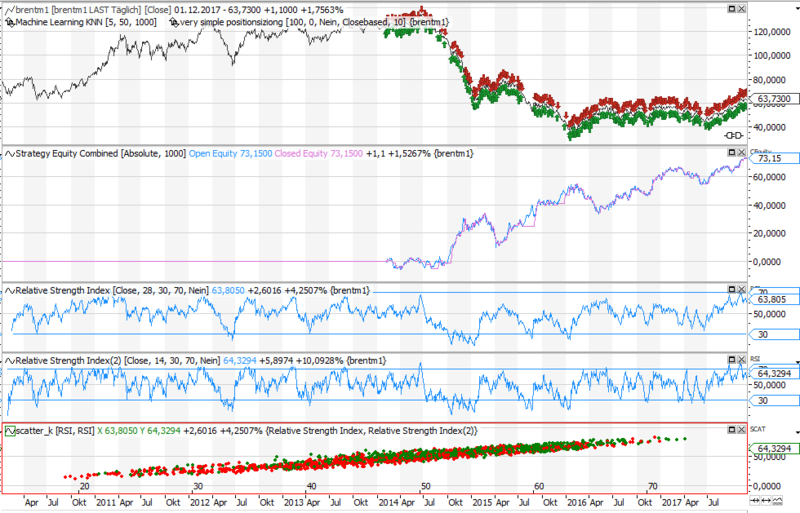 It seems to be possible to use these two RSI indicators to predict tomorrow’s Brent move. Autocorrelation is the correlation of the market with a delayed copy of itself. Usually calculated for a one day time-shift, it is a valuable indicator of the trendiness of the market. If today is up and tomorrow is also up this would constitute a positive autocorrelation. If tomorrows market move is always in the opposite of today’s direction, the autocorrelation would be negative. If autocorrelation is high it just means that yesterdays market direction is basically today’s market direction. And if the market has got the same direction every day we can call it a trend. The opposite would be true in a sideway market. Without an existing trend today’s direction will most probably not be tomorrows direction, thus we can speak about a sideway market. But best to have a look at a chart. It shows a backward adjusted daily time series of German Power. The indicator shows the close to close autocorrelation coefficient, calculated over 250 days. You will notice that it is always fluctuating around the zero line, never reaching +1 or -1, but let`s see if we can design a profitable trading strategy even with this little bit of autocorrelation. To define the direction of the autocorrelation I am using my digital stochastic indicator, calculated over half of the period I calculated the autocorrelation. Digital stochastic has the big advantage that it is a quite smooth indicator without a lot of lag, thus making it easy to define its direction. The definition of a trending environment would just be: Trending market if digital stochastic is above it`s yesterdays value. The most simple trend following strategy I can think about is a moving average crossover strategy. It never works in reality, simply as markets are not trending all the time. But combined with the autocorrelation phase detection, it might have an edge. Wooha! That`s pretty cool for such a simple strategy. It is trading (long/short) if the market is trending, but does nothing if the market is in a sideway phase. Exactly what I like when using a trend following strategy. To compare it with the original moving average crossover strategy, the one without the autocorrelation phase detection, you will see the advantage of the autocorrelation phase filter immediately: The equity line is way more volatile than the filtered one and you got lots of drawdowns when the market is sideways. 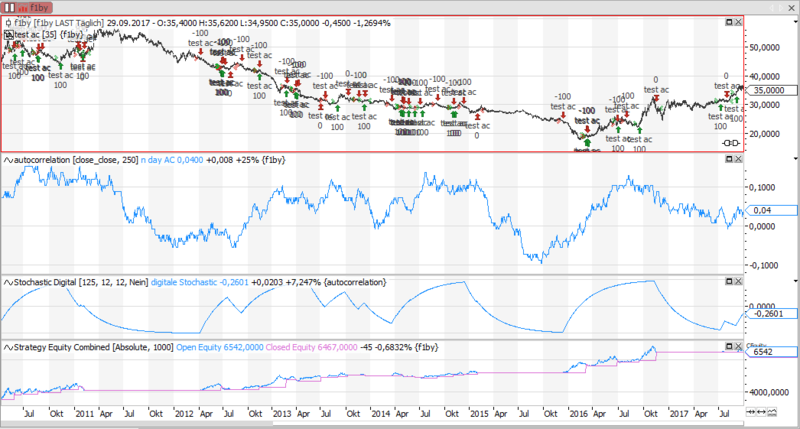 German power has been a quite trendy market over the last years, that`s why even the unfiltered version of this simple trend following strategy shows a positive result, but let`s have a test on the period of the moving average. 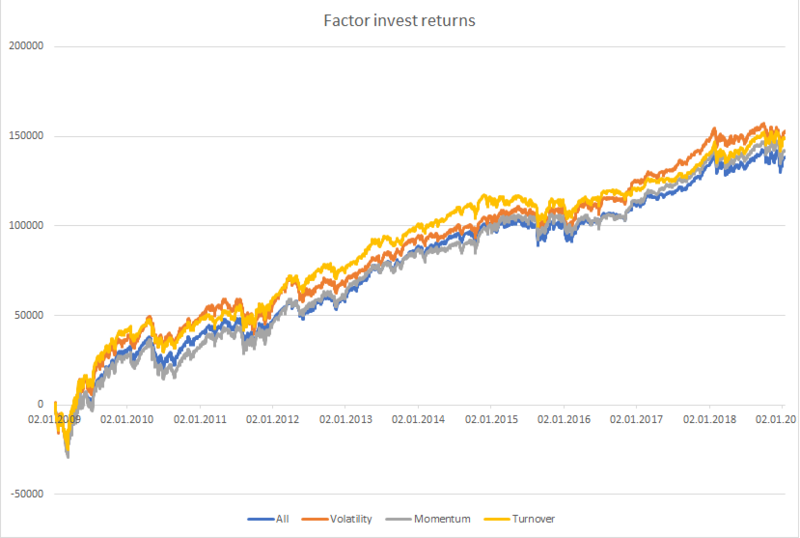 Therefore I calculated the return on account of both strategies, the unfiltered and the autocorrelation filtered, for moving average lengths from 3 to 75 days. Return on account (ROA) =100 if your max drawdown is as big as your return. 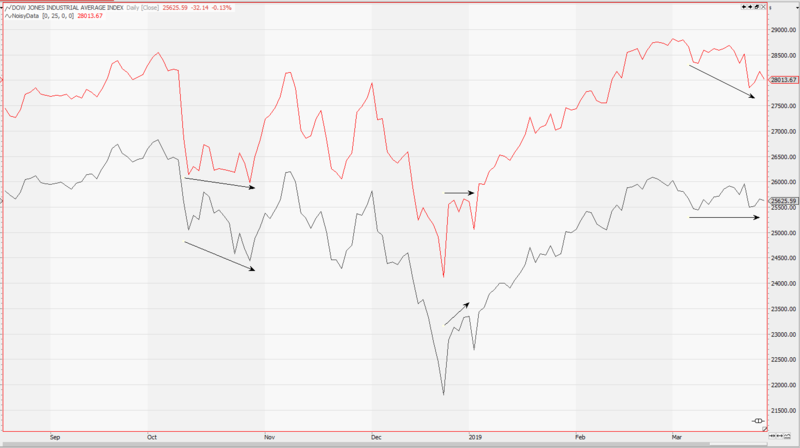 The left chart shows the autocorrelation filtered ROA, the right side the straight ahead moving average crossover strategy. You don`t have to be a genius to see the advantage of the autocorrelation filter. Whatever length of moving average you select, you will get a positive result. This stability of parameters can not be seen with the unfiltered strategy. Trend following strategies are easy to trade, but only make sense when the market is trending. As shown with the tests above, autocorrelation seems to be a nice way to find out if the market is in the right phase to apply a trend following strategy.